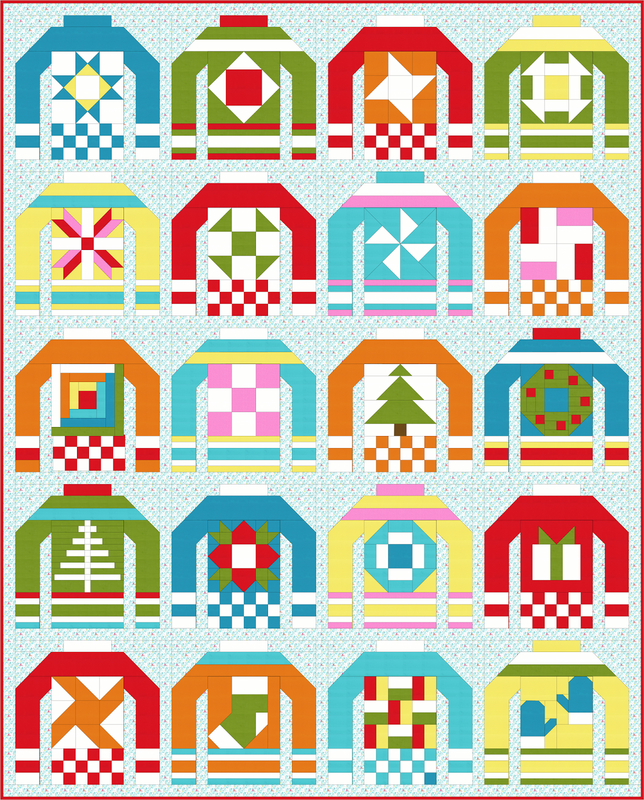 Step 1: Arrange your completed Ugly Sweater blocks according to the size of quilt you are making. Sew the Background 1.5” x 12.5” short sashing strips between the blocks in the rows. Step 2: Sew the Background 1.5” x 51.5” long sashing strips to the bottom of the rows. Sew the rows together. Step 3: Sew the Background side border pieces on the sides. Step 4: Sew the Background top and bottom border pieces on the top and bottom to complete your quilt top. Step 5: Prepare your backing and batting. Baste the quilt. And quilt as desired. Trim and bind your quilt. The instructions for all 21 of the blocks in the Ugly Christmas Sweaters QAL have been given. Today's tutorial is for the Bonus 2.5" half square triangles! If you have quilted along, and have made the 20 blocks for the Maxi size quilt, you will have 40 Bonus 2.5" HST's. I chose to use my HST's to make this beautiful 16" x 25" Sewing Machine Mat. That way I will always have a reminder of the Ugly Christmas Sweaters quilt, how much I enjoyed making it, and how much fun it was to have you all quilting along with me! This 16" x 25" Sewing Machine Mat was made using 40 pieces of 2.5" squares. I used my Bonus HST's, but any 2.5" squares will work to follow this tutorial. Batting and Backing to cover 20" x 30"
Step 1: Arrange your 2.5" squares into a grid with 8 pieces per row and using 5 rows. Step 2: Sew the 1.5" x 2.5" strips to the bottoms of the pieces in the first 4 rows. Step 3: Sew the pieces into columns. Step 4: Sew the 1.5" x 14.5" strips between each of the columns. Step 5: Sew the 1.5" x 25.5" strips along the top and bottom. Step 6: Layer the backing, batting and finished top. And baste. Step 7: Quilt the layers. And then the trim edges. Step 8: Apply the binding. Welcome to the Let's Bee Social and thank you so much for making this party such a success! I still don't have any "real" works in progress to show you this week. But I do have this virtual WIP. It's really outside of my normal range. I have been spending a lot of time working on "one block" designs. But I love trying something new every now and then. I would say this Bear Paw design is very Modernitional. A while back, I was contacted by Georganna Hawley, who is the guest curator for a quilt exhibit coming to the Ontario (California) Museum of History and Art, titled Modern Quilts: Redesigning Traditions. The exhibit will run from December 1, 2016 through January 22, 2017. Please click here for more information about the exhibit and how you can enter! Farmers have been known to advise that you should not keep all your eggs in one basket. And I really do agree with that advice. Although I do have an Etsy shop where I can sell patterns, I also opened a PayHip pattern store. But what if your one basket has a hole in it? I think you have to either find a new basket or start putting all your eggs in the one good basket. I have been getting quite a number of emails lately from people complaining that they are unable to download their pattern purchased from my PayHip pattern shop. Or that they are unable to make a purchase using their credit card without signing up for a PayPal account. I have been replying to these emails and sending the patterns as an attachment when they are unable to download. And I have been directing those wishing to pay by credit card to my Etsy shop where they have been able to successfully make purchases from there. So, over the next little while, I will be phasing out my PayHip shop and directing those who are interested in purchasing patterns to go to my Etsy shop from now on. 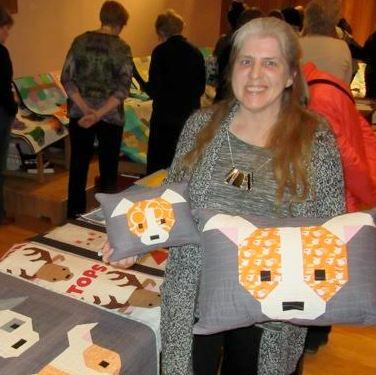 On Monday I provided a Trunk Show for the Etobicoke Quilters' Guild (EQG) and was able to bring along some of my very first professionally printed patterns to sell. It has taken me forever to find the motivation - and a printer who could offer me a decent price - but this is now happening! 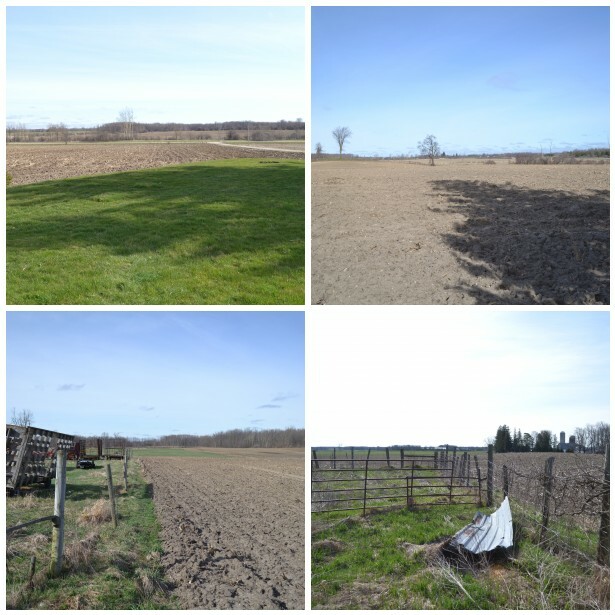 You know I am a real country girl and literally live in the middle of nowhere. Really we have no neighbours to speak of. Except maybe if you include these ladies. So heading to Etobicoke was taking myself WAY outside of my comfort zone. Like on the outskirts of the largest metropolis in Ontario. Population one two many digits for me. The big TO. Toronto, Ontario. After a quick car wash to remove the dirt road dirt from a long winter, I headed out. And thankfully made it to the Neilson Creative Arts Centre on time and in one piece. I learned that the Etobicoke Quilters' Guild was formed in 1975 and has been the longest running guild in Canada. The show was a lot of fun and I enjoyed meeting all the members. Especially Judy, Karen, Janice and Chris. And I will be heading back to do a workshop in June. I have not sewn a thing since finishing my KYSS Me by the Garden Wall. But have been working on revising and condensing patterns to prepare them for printing. And also working on new designs. The computer is, lately, more familiar to me than the sewing machine. I do have another super sweet finish to share with you. 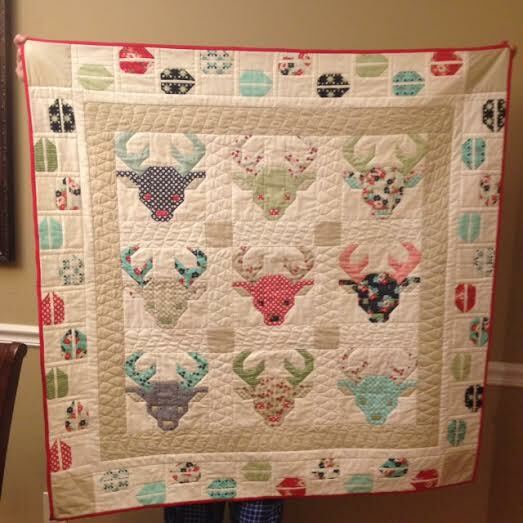 Christy sent me an email last week saying, "Just wanted to send a couple of pictures of the baby quilt I finished using the deer head and deer hooves patterns I purchased earlier this year. Love your patterns!" 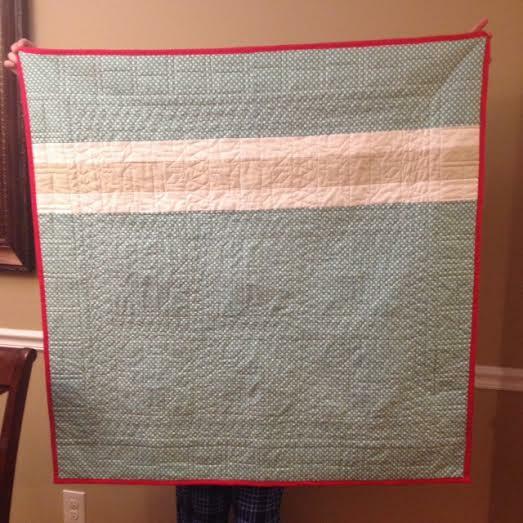 When I replied to Christy's email and asked for permission to share, I also asked her if she could tell us more about this cute quilt. And she said, "It ended up about 44.5 x 44.5 when I finished. My former manager was an avid deer hunter- and that would be putting it mildly. When I found out that he and his wife were expecting their second child I knew I wanted to find something that had a hunting theme. Because they didn't want to find out if it was a boy or girl, I decided to use Bonnie & Camille's Daysail fat quarter set. It had lots of primary colors and came together well. " Christy went on to say, "I ran out of time when it came to finishing it so I ended up stitching it all in the ditch and then going back and adding some ribbon candy in the border and sashing. 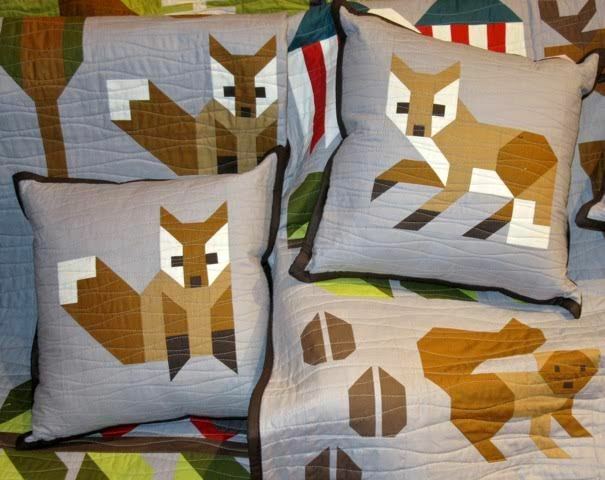 I would've like to have quilted it a little more, but just ran out of time!" I don't know about you.... But I think this quilt is perfect just the way it is. And there is going to be one little hunter who will be very pleased to be cuddled up under this sweet finish! Are you up for it? 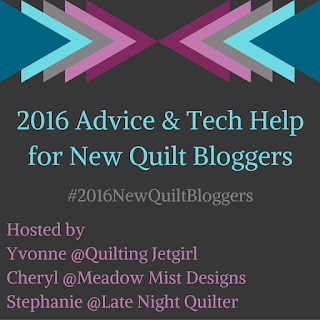 Announcing the opening of registration for the 5th annual New Quilt Bloggers Blog Hop! If you are a new quilting blogger, you don't want to miss out on this exciting and informative opportunity! I took part in this event back in June of 2013. You can read my post here. This experience will change your life!!!! 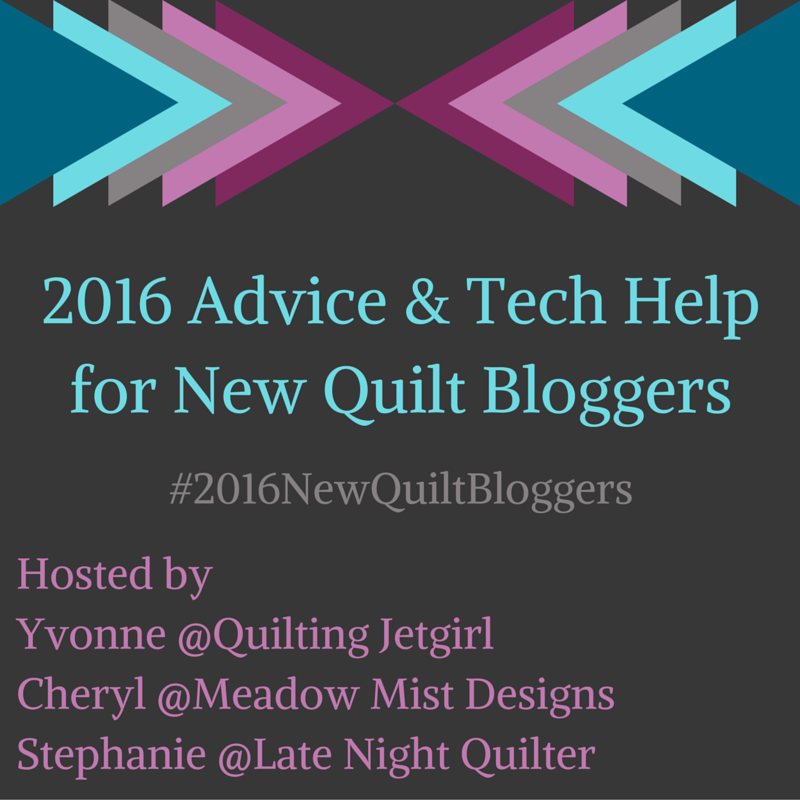 Yvonne @Quilting Jet Girl, Cheryl @Meadow Mist Designs and Stephanie @Late Night Quilter. 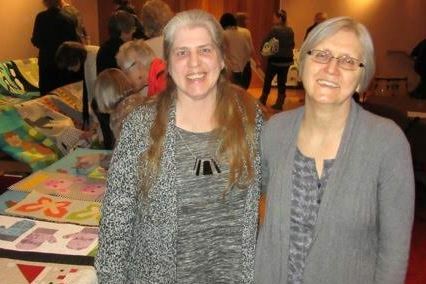 This past week, I had the great pleasure of providing a trunk show the Royal City Quilters Guild. You know.... I am a real home body. And prefer to stay tucked away nicely in my little home with my little family. In my pajamas. 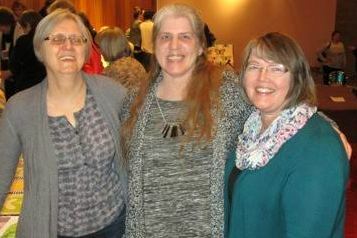 But it is wonderful to have an opportunity to get out and mingle with other quilters. People who really get me and can understand what it is that motivates me. And what makes me truly happy. It was so much fun to meet all the guild members, but especially nice to finally make the acquaintance of a few of my bloggy pals. One of which, not pictured below, was Nicole of Snips Snippets. I have to admit that I am more familiar with seeing Nicole over here on her Instagram. It was Nicole's first time meeting with this group in Guelph after she was encouraged to attend by some friends who had recently joined. And they are a great group! Now this is Lisa of Sunlight in Winter Quilts. Lisa has been taking part in the Let's Bee Social for quite some time now. It has been wonderful to develop a friendship through our online visits back and forth. But it is even better to be able to finally meet in person! And here we have Kathy of Kathy's Quilts. She was kind enough to encourage some photo taking and sent a copy along to me by email with permission to share them here on the blog. I'd love it if you took a minute to check out these ladies and see what's happening with them on their blogs! Of course my quilts came along for the ride. I really enjoyed bringing them out and being able to talk about them at the meeting. And following the showing, we had a question period. Some of the topics we discussed were basting and quilting methods, fabrics and thread. Many were interested in the wavy line quilting performed using the walking foot. I hope you all are not getting tired of seeing my quilts finished in this way. This method has really grown on me. I find it to be a soothing and stress free way of finishing my quilts. And hope maybe I have helped to inspire more quilters who would like to try something new, to give it a go! It was so much Dog Gone FUN!!!! So much so that I am looking forward to doing it again soon. On Monday I am heading to Etobicoke to meet with the Etobicoke Quilters' Guild! Thank you so much to those of you who took part in the Mad for Solids competition, hosted on the Inspired by Fabric blog and sponsored by Paintbrush Studio. Thanks to you, my friends, Banff National Park was declared the winner on Wednesday afternoon. Congratulations to the two lucky participants who each won 1 yard cuts of the 8 fabrics in the bundle - Lady Dragoness and April Shae! And thank you to Lisa who organized this wonderful event. Be sure to follow the Inspired by Fabric blog and keep up with all the other creative events they have lined up! Please accept this small token of my appreciation. Giggles Up! charm square pattern is a FREE download for the weekend!! !